Been doing a bit of online window shopping (as you do) today. So many great pieces out there at the minute – cannot WAIT for retailers to bring out their full A/W ranges. I am a massive fan of online retailer ASOS and they have already got some of the best pieces I have seen for autumn/winter ’10 from what they’ve brought out of their range so far! One of the best capes I’ve seen! in 2 colours – black and khaki. 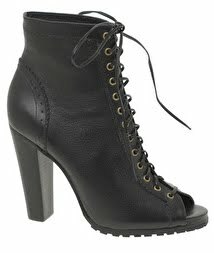 The heeled boot – hiking, lace-up, peep-toe. 3 in 1. Perfect for this season. Utility is still big business for A/W10 and these trousers will see you from the end of summer right through to winter. I’ve been greedy and chosen 2 – leopard print and a faux-fur collar. Both fantastic pieces. My pick of basics and essential items for any trans-seasonal wardrobe. I want all of them! Can’t wait for the next lot of A/W products to go live on ASOS, I know where I’ll be spending my cash! Next Post Get Tough. Be Bold. And go bananas.